In the early days of every summer, people start thinking how great it would be to own their own swimming pool. 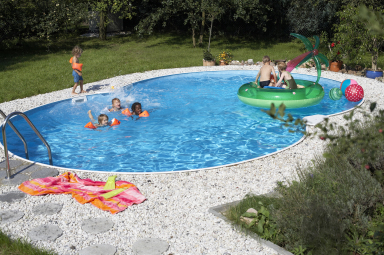 If you are considering owning your own pool, don't hesitate to call us for a non-binding chat about the options open to you, including an overview of the different types, sizes and accessories available. If you already own a swimming pool which needs some care and attention, we supply liners and other replacement parts. Once you have these things sorted out, all you have to do is lie back and enjoy your pool. We can also supply ladders, cleaning and maintenance equipment, pool covers, etc.